Sometimes the best chance you have in saving a diseased or injured tooth is with a root canal. You shouldn’t let your fear of an unknown procedure stop you from saving your tooth. Answers to some frequently asked questions may resolve your fears. Inside every tooth is its pulp, which is soft tissue that supplies nerves and nutrients to the tooth. It connects with the tooth’s root. If the pulp is damaged, your tooth can get infected and often the best action is a root canal in which the pulp is removed. The canal is reshaped, sealed, and covered with a crown. Your tooth likely cannot heal once it has become infected. Pus may develop at the root tip and cause a painful abscess, which can damage your bone as well as your tooth. Your tooth can become loose and fall out. If your tooth has reached the point where losing it is possible, it is almost always better to save your tooth with a root canal instead of opting for tooth extraction. The most common causes of pulp damage are trauma and irritation from tooth decay that has spread to the nerve. The result of these things can be infection and advanced decay from bacteria attacking the nerve. Some indications you might need a root canal include facial swelling, tooth sensitivity, and pain. These can occur at varying levels and are not unique problems, so see your dentist if any of these symptoms develop to diagnose the problem. Do I need a special dentist? 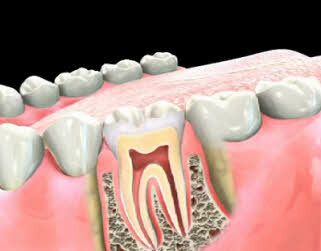 Most general dentists refer patients to endodontists, who are trained in more complex procedures associated with pulp. Endodontists have lots of experience in performing root canals and related procedures. Contact our Woolwich, NJ dental office to learn about root canal options.